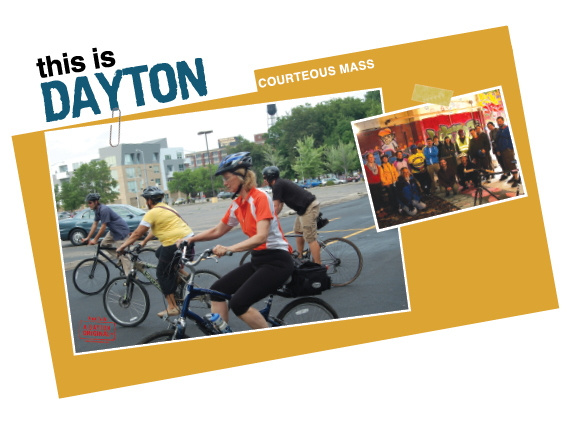 Courteous Mass is an event – an urban cycling ride through Dayton. The ride is free – all you need to bring is a bike. Rides are the first Friday of every month. Gather starting a little after 5:00 pm. We ride at 5:30. Gathering Spot: Plaza in front of Fifth Third Field (Dragons stadium) – Monument at Patterson. Favorite Band Right now…Andrew Bird. Where do you play hookie in Dayton On the MetroParks hiking trails with my dog, Alexander Supertramp. What will be your legacy I left things better than I found them. Favorite Destination Dayton, it’s always good to come home. I won the McPherson Town Chili Cookoff last year with my Indian Pumpkin Chili and have a gold spoon to prove it! This entry was posted on Wednesday, September 9th, 2009 at 10:20 am	and is filed under This Is Dayton and tagged with biking, recreation. You can follow any responses to this entry through the RSS 2.0 feed.